A comprehensive web design tutorial in PDF format using the free web editor Kompozer powered by Mozilla, step by step instructions with screen shots in PDF or MS Word format. This tutorial does not require any prior knowledge of web editing or web coding and will enable you to build your own web page. The tutorial is laid out in easy to follow steps with the novice user in mind and features full color screen shots. 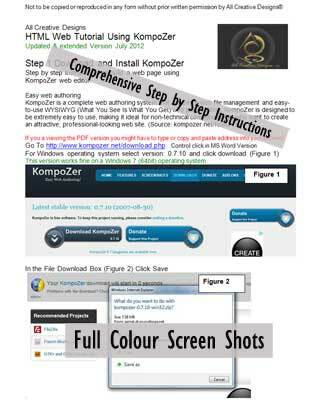 It explains how to download the Kompozer web editor software, install and run it on your computer. Find full instructions to create a professional looking and full functional web page for the world wide web using Cascading Style Sheets. The KompoZer web editor is a free standing (also called portable) application, which means that files don’t have to be installed into Windows program files and can be run from any folder on your computer or even your USB stick. Step 4: Creating a Banner using CSS Cascading Style Sheets. There is a choice of PDF or MS Word documents formats to download. Word document was created with MS Word 2007 in compatibility mode, use our PDF download if you are having problems with the word doc version.